Why Veneers Are Right For Your Smile? There's no doubt that having a pretty, white smile is in high demand with patients across the country. According to the American Academy of Cosmetic Dentistry, Americans spend roughly $2.75 billion every year on cosmetic dentistry. When a patient wants a smile that is as close to perfect as possible, cosmetic dentists at Comprehensive Dental Group in Stamford, CT often recommend porcelain veneers as a part of the treatment plan. The process of getting porcelain veneers begins with a consultation. Call the Stamford, CT office of Comprehensive Dental Group today at (203) 359-3296 to schedule a visit to discuss this cosmetic treatment. For more information on Porcelain Veneers in the Stamford, CT area call Comprehensive Dental Group at (203) 359-3296 today! 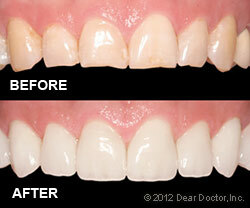 Read our Related Veneers Blog Posts.